The month of March is all about movement. During the winter season, things in nature appear dead and dormant. Now we have entered into a season of movement. Spring has made it’s move as the beautiful foliage in nature blossoms all around us. Nature is leading the way for us to start movement and Spring into Action! How do you know if you need to Spring into Action? You know you need to spring into action if you are not satisfied with the results any area of your life, and you want to change or improve those results. Many of you made a commitment to improve your health, fitness, or overall wellness this year. What actions have you taken thus far towards those goals? Small consistent changes are good, but I encourage you to do more this Spring. 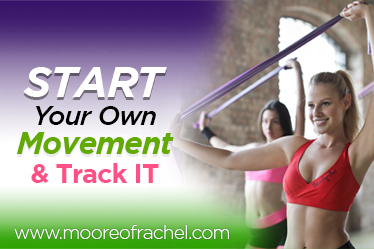 “Start Your Own Movement” and Track it! One of the definitions for Movement is a series of organized activities working toward an objective. If your objective is loose weight, to loose belly fat, to build muscle mass, or to improve your health, then you must have some organized activities that you are consistently doing to reach those goals. In addition to having organized activities, like a starting and sticking to a workout plan or to a new meal plan, you need to have some means to track what you are doing. When you track your activities, it’s easier to measure your results. During my 1st Quarter Empowerment Call last week, I shared several Easy Ways to Track Your Fitness Progress. Here are a few things that I suggest you Track. Fitness Activity – workouts (type and time) – track exercise activity – examples – cardio, strength training, etc. Keep me posted on your fitness progress by posting comments on this newsletter post on my mooreofrachel.com site. Just look for the “Start Your Own Movement & Track It” image or post title or post a comment on at www.facebook.com/mindyourvision under the post for Movement. 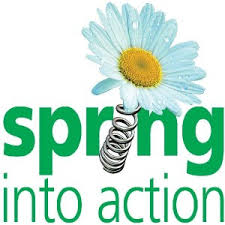 Spring into Action PODCAST will inspire you to Movement. One half of a regular sized avocado contains 10 grams of healthy mono-saturated fats, which stop the blood sugar spikes that tell your body to store fat in your belly. Click here to read the details of my challenge and success in trimming my tummy over a short period of time.